This week, the Biobank recruited its thirty-fifth-thousandth participant, and we're still growing. With every patient who graciously agrees to have their blood drawn and answer a questionnaire, we are one step closer to offering more individualized medicine for all of our patients. 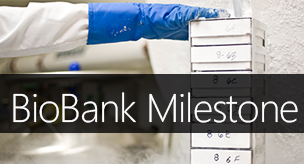 When the Mayo Clinic Biobank began recruitment on April 1, 2009, the initial goal was to recruit 20,000 participants. Having passed that back in June 2011 -- 6 months ahead of schedule -- we realized just how much our gracious and grateful patients recognize the possibilities opened by such a massive collection of samples and clinical outcomes information. So what is a biobank? Strictly speaking, it's any collection of biological specimens. At Mayo Clinic, though, we have taken the crucial step of including clinical data with participant samples. Taken together, the genomic and clinical information gives researchers unprecedented ability to study everything from heart disease to cancer and diabetes much faster and at a lower cost than ever before. Participants' samples and health information are available to researchers for many types of studies, and this information will be updated periodically so that participants can learn more about how the Biobank is helping to advance clinical research at Mayo Clinic. The Biobank is a key area of focus of the Biorepositories Program that is overseen by the Center for Individualized Medicine at Mayo Clinic. Biobanks are a very important part of performing medical research and have aided in many studies with important implications for improving health. Some of the projects that the Biobank has aided in are the RIGHT Protocol, renal cell cancer study, whole exome sequencing studies, and many more (you can find the whole list of projects here). A new state-of-the-art facility for the processing, storage and distribution of all types of biological samples is now under construction, and this will provide a highly standardized and automated one-stop location for all existing and future biorepository specimens. We are very excited by this milestone, and the opportunities to further research it provides to benefit our patients.